Tonight is the night! Yesterday we hung the art and it is all ready for viewing. My husband helped, and he was wondering where I had been hiding it all. Here is a sneak peak at some of the titles for you, and a photo of me hanging some of my first ones on the wall of the lovely gallery at The ARTS Project. “Turbulence & Bubbles”; “Stardance”; “Nature’s Drapery”; “Negative Nebulae”; “Mother of Moths”; “Fried Eggs”; “The Mage Emerges”… There are 39 pieces of art in all. The ones you see in the photo are watercolour paintings on paper. I would like also, at this time, to acknowledge the excellent digital image printing services of Posterjack, of Toronto. They are the company which I use to print my digital fractals on metal. Over the course of three years they have consistently provided wonderful service and attention to quality. The show consists of 18 paintings, 15 metal prints, and six photographs. The photographs were printed using high quality archival paper and inks by Highlander Studios, of Woodstock, and I am so pleased with the results! Some other tools I have employed to make my art are the software which I use to generate the fractals I start with. I have primarily used Spangfract XTel, and Oxidizer, on my iMac. These programs provide me with infinite possibilities and I thank them for that! My frames and many of my other art supplies were purchased at Guthrie’s Art Supplies & Framing, of London – mainly because they also provide excellent service and reasonable prices – and Olga knows me when I walk in. 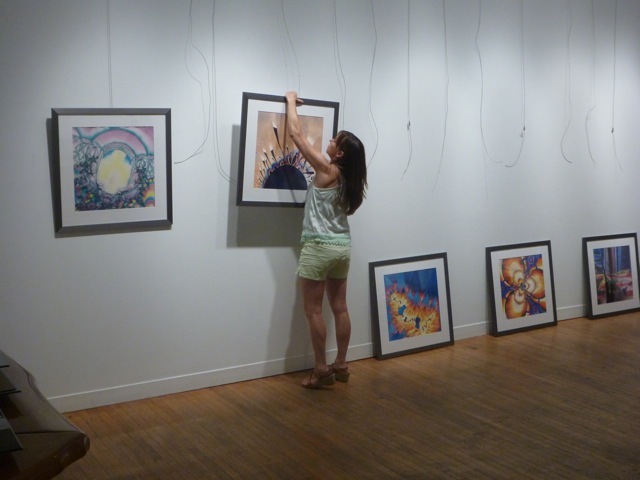 Richard and Sandra, at The ARTS Project, were very helpful with advice and equipment for hanging yesterday. Finally, I would like to acknowledge the funding support from the Ontario Arts Council, an agency of the Government of Ontario. I hope, if you are able, you will join me tonight as we celebrate the show opening. 7-9 pm! This entry was posted in Art, Fractals, News and tagged fractals, Lianne Todd, Metal Prints, Opening night, Paintings, Photography, The ARTS Project, The Fractal Nature of Our Universe, Watercolors, Watercolours by Lianne Todd (artist). Bookmark the permalink.